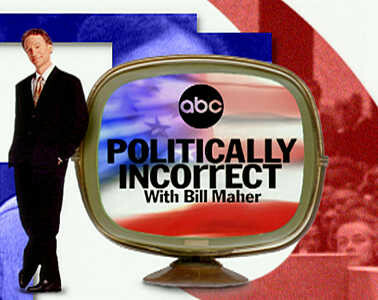 Bill [Maher]: All right, good evening, welcome to "Politically Incorrect." Let me introduce you to our panel tonight. Over here we have Dr. Maher Hathout. He is the leading spokesman for the American Muslim community as the senior adviser of the Muslim Public Affairs Council. Welcome, Doctor. Bill: Naomi Wolf, of course, a frequent guest of ours. Glad to have you back. Her new book, "Misconceptions" right there. But we all know her from The Beauty Myth, Fire with Fire and some advice to Al Gore. Over here we have Mr. Daniel Pipes. He is an adviser to the White House and the Defense Department and the editor of the Middle East Forum. And of course, Alec Baldwin is Alec Baldwin. He probably will be a senator or president one day, but I always encourage him to stay in show business 'cause I think he's very entertaining. And his new film is on HBO coming up called Path to War. Give a hand to this panel. [ Applause ] Okay, now, let me tell you, I could hardly contain the excitement here around the office today when the staff found out that the Northern Alliance had taken Kabul. [ Laughter ] I'm telling you, people were practically dancing in their offices. And I guess that's good news. But of course, as usual, I think that the bigger story sometimes is buried on page 15 of the paper, not that taking Kabul isn't a good thing. Bill [Maher]: -- Jones, or "fiending," as the kids say now, Alec. [ Light laughter ] You're dating yourself. Maher: We need to take Venezuela also on, Mexico on, other areas that are not Muslim countries who are still controlling oil. Bill: 70% in Saudi Arabia. Daniel: But, Bill, you like to go from 0 to 60 real fast, don't you? And if you want to do that, you need oil at this point. Electricity, you know those little carts on the golf course? Bill: Hey, you're wrong. I drove one, I'm buying one. A hybrid car gets 55 miles to the gallon. Daniel: A hybrid, I was gonna get to that. A hybrid's a different story. Daniel: But it's electric cars. Bill: Well, it's half electric. Daniel: Explain to us what a hybrid car is. Bill: It's half electric and half hybrid. [ Laughter ] Half electric—but you don't have to plug it in. I think there's that old Ed Begley go-cart that people think about. Daniel: But that's on the way. It's coming, the hybrid. Daniel: The hybrid is coming. Alec: The hybrid is here. Naomi: The hybrid is here. Bill: The hybrid is here, I'm telling you. Alec: Toyota, Honda. Ford's gonna have one as well. How many people here don't know what a hybrid is? Clap if you don't know what a hybrid is. [ Light applause ] It's a regular car, an internal combustion engine, that charges a battery while you drive. Alec: And it has a computer that tells it when to switch over to the battery. When the battery runs down, the computer tells it to switch back to the gasoline power. Naomi: Even if these were really successful technically, we don't have the political will to wean ourselves off of foreign oil unless big oil isn't sitting at the table, unless we have campaign finance reform. Bill: Yes. I mean, Saudi Arabia is the center of evil in all this. I know people don't want to hear that, but it really is. Alec: Saudi Arabia in conjunction with the Congress are the center of evil. Bill: The Congress of the United States? Alec: Sure, I mean, not fighting for an energy policy in which we're going to wean ourselves from this. In the wake of this event, you have tens if not hundreds of billions of dollars are gonna be committed to programs. And I think to myself, "Why don't we commit $20 billion or $25 billion to have a program to cut our consumption of oil by 20% or 25% in the next 15 years in this country?" Daniel: The automobile companies are going in this direction on their own. Bill: You've got to be kidding. Bill: I just read this. They said they had to postpone. Daniel: You read to me about electric cars. You didn't read to me about hybrids. Bill: Hybrid, you know what, I'm trying to get one. I'm trying to sell this thing. They don't have one for me yet, okay? Daniel: It's not an easy technology. Naomi: You're mistaken. The technology exists. Maher: It doesn't have be easy if we are serious about being independent and not getting the oil cheap at any price. Daniel: It's taking a few years to develop this. Maher: It doesn't have to be easy. Daniel: And by bringing in the government, you're only gonna mess it up. You know that. Daniel: You know that bringing in the government will mess it up. You know that. It's always the case. Alec: That's a kind of a tired tone you have. We don't know that. Why don't you share with us why you think the government's gonna mess it up. Tell us why you think that. Daniel: Well, I mean, let's take the Postal Service versus FedEx. Daniel: Let's take any kind of government service versus private enterprise, and almost invariably, there are a few exceptions I grant you, the government messes it up. I don't want the government doing this. Naomi: It's extraordinary to share a conservative argument at a time like this, because when the nation is under threat we all understand that there are some things only government can do, like security at airports, for example. Daniel: What are you talking about? [ Scattered applause ] Why do you assume that government can only do security at airports? Naomi: Well, I think that it's a debate right now that's heading in the direction of more government control. Alec: When you let the airline industry and the airline lobby influence how the security contracts were gonna be awarded now and how much money was gonna be spent, you have people that are working for $4 an hour at airports. Daniel: Let me remind you that Logan Airport at Boston has the worst security in the country. And why does it have it? Because of United and American Airlines or because of a terribly patronage ridden hierarchy in the political—you know, the political bosses at Logan Airport are completely incompetent. If you want incompetence go to the government. Maher: But this can be corrected. It doesn't have to be bad on its own. I think the center of evil, I guess, is the culture of consumerism. I think we are trained to get what we want at any price as fast as we can. From whichever way. Maher: The alternative is to be more serious. If we want really to be independent we do what independents did. To be a little bit austere. We don't have to go from 0 to 60 in five seconds. Maher: We can drive slower than what you are driving. And we can affect it in the interest of our country at large. Bill: Aren't we in a new world today where we're supposed to be patriotic? You mean going from 0 to 60, that's on your priority list ahead of our security. Daniel: Wait a minute. You're putting words in my mouth. Bill: You just said, "It may not be important to you, Doc, to go from 0 to 60, but for some of us it is job one, and everything else can take a backseat." Daniel: I didn't say that. Alec: Let me ask you this question. Alec: Let me ask you this question. You think if it's important for some people to go 0 to 60 they should go 0 to 60 if that's in the interest of free enterprise. But do you believe attorney/client privilege is sacred? Daniel: I do, in general, yes. Daniel: I do indeed, yes. Alec: Oh, you do. So you think attorney/client privilege is a little less significant than the right to go 0 to 60. Alec: You're coming across that way whether you realize it or not. Daniel: Let me explain what I do think. Alec: I'm eager to have you explain. Alec: Our dependence on oil and our need to destabilize countries in that area is getting in our way. Naomi: Jeopardizing our security again and again and has for decades. Alec: All of what we're going through right now wouldn't happen if it weren't for our dependence on oil. Bill: How can you, obviously a really smart guy, not make the connection that Middle East oil funds terrorism. Bill: Every time you're giving money to the people who give you oil they're putting some of it back into the terrorism. Now, what connection—how much do I—where do I have to put the thing in there, doc? [ Laughter ] What are you missing there? What is the connection? Maher: I think it is at least funding the dictatorship. Again, it's not a Democratic revolution in that area of the world. Maher: To say the least, and make us look very hypocritical. Maher: Speaking democracy one way and hugging every dictator in the world on the other way. Naomi: And it shows why we're having such a difficult time making the case about our values and what we believe in to the Muslim world. Daniel: Glad that everybody agrees. Bill: All right, we're talking about really what's real and what's not. Let's talk a little bit about our policy here with President Bush. What he does constantly—I think it's a good thing—is he poses with a lot of Muslim Americans and makes the point that this is not a war against Islam, which is true. On the other hand, we are fighting people who are all in that religion and that religion is, I think, being yanked frightfully toward the far right and the 7th century without a lot of opposition in the religion. Okay, it turns out some of the people he has posed with wind up having contacts really with terrorists. I don't know if this person was, but there's a professor at South Florida university—he's Palestinian. He organized an Islamic think tank on the campus, sponsored such visitors as Sheikh Omar Abdul Rahman, who was the architect of the first World Trade Center bombing, and Hassan Turabi, who, I think, was the guy who, in the Sudan, invited bin Laden to stay there when he was in the Sudan. Maher: How far we go? Really, seriously, about—if a guy is investigated or not, if he is investigated and is cleared by the FBI, he has every right like every other American citizen to speak out his mind whether it is popular or not. I think this is the essence of democracy. This is why a person like me uprooted himself from where he came to live here. Bill: But this is wartime. I mean, free speech is not absolute. Naomi: No, Dr. Hathout is so right. If you've gone back and looked at like "Life" magazines or the kind of culture that came out of Hollywood in 1942, it's all happy faces, it's all smiling people going off to war. Very soon thereafter World War II, there was a crackdown on intellectuals, anyone who lived in the margins of society, who had a different lifestyle with—no longer welcome in the community. Bill: There probably weren't smiling faces among the Japanese that they threw into internment camps. Naomi: Right, but that wasn't part of what people got to see in the United States. All I'm saying is, well, we have to make some tough calls right now about national security and about civil rights. At the same time, I agree with Dr. Hathout that we've absolutely got to cherish descent and listen to people who are saying that we have to debate. [ Applause ] Even about the things that are uncomfortable. Bill: But this guy is having visits by terrorists themselves. Doesn't that go past—? Alec: There's free speech, and there's something beyond it. I mean, if one wants to debate what the U.S. Government should be doing—Afghanistan, Iraq, and so forth—that's perfectly legitimate. But when you have people who are in contact, as you pointed out, with terrorists who are rooting for the terrorists, then you got a problem, and that, I think, goes beyond free speech. And to go back to the original point, Bill, about the president meeting with these characters who are, essentially, on the other side, that's a terrible mistake, and I'm hopeful that's not a mistake you'll be repeating. Naomi: We're not suggesting saying there should be support for terrorist activities. We're saying that in a democracy under threat, like democracies under threat all over the world, have more experience with this. There's a constant struggle between security and upholding civil rights and free speech, and we need to be grown-ups and wage that war every single day to make sure that we don't stifle dissident, unpopular views get heard as well. Maher: There is a terrible generalization and oversimplification here. He said he is inviting characters. By the way, I was one of those characters. I am not a terrorist. Maher: I do not support terror. Alec: You support—[ All talking at once ] I've got to quote. I've got to quote. Daniel: He's got to quote. Alec: "L.A. Times." I'll give you a little bit of background. Early August 1998, two American embassies in East Africa get destroyed. The United States then retaliates in Sudan and Afghanistan. Dr. Hathout, two weeks later, tells "The Los Angeles Times," "Our country is committing an act of terrorism. What we did was illegal, immoral, inhuman, unacceptable, stupid and un-American. Worse—the American attacks on the Afghan and Sudanese targets were worse than what the terrorists had done." Alec: You're putting words in my mouth again. I didn't say—I didn't say he doesn't have free speech. He can say—what I'm talking about is the president shouldn't be meeting with a character like this. Alec: But I just figured out something. [ Turns to Daniel Pipes ] You're not really a professor, are you? [ Laughter ] You were in a movie with me back in 1989. I remember you. You're not a doctor. You're an actor posing as a doctor. Daniel: What's your problem with it? What's your problem with it? Alec: What's my problem with what, of violating attorney/client privileges? It's unconstitutional. It's unconstitutional. Daniel: It says in the Constitution that there is attorney/client privilege? Alec: No, but it's been ruled as an interpretation of the Constitution. Daniel: Well, then you can rule a different kind of interpretation, can't you? When there's time of war, when you're afraid that those clients might be signaling through their lawyers new acts of terrorism. Alec: You can try, but, hopefully, most Americans, which I think don't agree with Ashcroft. They think it's an idiotic idea. Daniel: I don't think it's idiotic if it's gonna protect me. Bill: Not funny. [ Laughter ] All right, let's talk a little bit about what happened today. Yesterday, they took Kabul. Or Ka-bull. What is it, Kabul or Ka-bull, doc? Bill: Kabul. Okay. And it rhymes with "Rubble," how fitting. [ Laughter ] And we're celebrating this, I guess. But I don't know if it's something to be celebrated so much because it seems like the Taliban just went away to their caves. We've actually smoked them into their holes now. Which may be—[ Light laughter ] Which may be the kind of war that they want to fight. And to them maybe this is really day one of the real war. Daniel: Kabul has a symbolic importance. And he who controls Kabul, in a sense, is the ruler of Afghanistan. And the fact that the Taliban disappeared. Bill: No. The Russians weren't. They controlled Kabul. Daniel: They controlled Afghanistan symbolically. They didn't control it in fact. Bill: Well, what good is that? Daniel: But the point is, it is very prestigious within Afghanistan to control Kabul. And it is an extraordinary development that the Taliban walked away. Bill: And that's what we're after there is prestige? Maher: I hope we get him one way or the other, no doubt about it, because it would save lots of people lots of grief and lots of life. But controlling Kabul, even symbolically, is not the end of the story because the history of Afghanistan is what they call retreat, counterattack kind of guerilla war that we call it. Bill: And this Northern Alliance. Maher: I felt great relief to see people celebrating in Kabul for the first time and smiling and cheering. Maher: And acting the way they'd like to act. How long is it going to last, we don't know. And what kind of behavior Northern Alliance will behave we don't know either, because they have a bloody history also in Afghanistan. Alec: That's why I questioned you. Will things get better when the Northern Alliance forces get this hold, and are things better for Americans militarily or are they better for Afghanis? Daniel: They're celebrating in Herat and in Kabul. People are just delighted. Why don't you take that as a testimony in itself? Naomi: We have yet to hear from women because as we're building this nation, um, Bush is reaching out to warlords of the past who are all universally male and he's not including women in leadership. Daniel: These are not Jeffersonian Democrats. Nothing is gonna be as bad as the Taliban. Daniel: The Taliban was a hideous regime. We can agree on that. Without mentioning the "30 Rock" star by name, the airline said an "extremely vocal customer" declined to turn off his phone when asked to do so by a flight attendant. The customer then stood up "with the seat belt light still on for departure" and took his phone into the plane's lavatory, the company continued. "He slammed the lavatory door so hard, the cockpit crew heard it and became alarmed, even with the cockpit door closed and locked," the airline's post said. The passenger was extremely rude to the crew, calling them inappropriate names and using offensive language," it continued. "Given the facts above, the passenger was removed from the flight and denied boarding." MSNBC has pulled the plug on Baldwin's Friday night show "Up Late," the network confirmed to POLITICO. The show was suspended earlier this month after Baldwin made an anti-gay slur at a photographer on the streets of New York. … Baldwin apologized in a statement on MSNBC.com, but some reports said that Baldwin had a rocky relationship with MSNBC well before the slur incident.